Freshpints.com: Pfungstädter Releases Weizen Radler Cans, Available Now In The U.S.
Pfungstädter Releases Weizen Radler Cans, Available Now In The U.S.
North America (May 25, 2017) – Pfungstädter Privatbrauerei has announced that its popular Weizen Radler, formerly only available in bottles and kegs, is now being canned and is available in the U.S. for the first time. 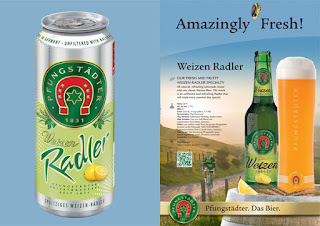 Pfungstädter Weizen Radler is a classic, authentic take on the Weizen style, and is a thirst-quenching blend of all-natural lemonade and Pfungstädter’s famous unfiltered Weizen. Radler (German for "cyclist") has a long history in Germany with cyclists demanding a refreshing, less-alcoholic post-ride beverage. It typically consists of a 50:50 mixture of beer and sparkling lemonade. Legend has it that a German innkeeper who couldn't keep up with demand blended his remaining beer with a fresh citrus lemonade. The regulars were impressed and refreshed, and the Radler style was born! Pfungstädter Weizen Radler is crafted utilizing top-fermenting house yeast, Hallertauer Herkules and Spalter Select hops, two-row malt blend, local malted wheat and low-sodium water from the private Pfungstädter fountain which lies within a protected nature park in the region. The result is a perfectly light yet flavorful and exceedingly drinkable beverage, not too sweet and ultra-crisp – perfect for any occasion. Food Pairing: Tapas, seafood, asparagus. Interested in selling Pfungstädter Weizen Radler at your restaurant, bar or retail store? Interested in becoming a distribution partner for Pfungstädter Privatbrauerei? Please contact Lanny Hoff with interest. For interview opportunities with Pfungstädter export manager Sebastian Ellies, or for more information about Pfungstädter Privatbrauerei and its historic world-renowned German beer, please contact Lanny Hoff at +1 (612) 245-5433 or by email at lanny.hoff@artisanalimports.com. About Pfungstädter Privatbrauere: The Pfungstädter brewery was founded in 1831 by Justus Hildebrand. Today, it is one of the few medium-sized breweries in Germany that is still 100 percent family owned. For generations, Pfungstädter has stood for sustainability and innovation as well as regional solidarity in South Hesse. At Pfungstädter, taste is up for debate but quality is not. This uncompromising commitment to excellence when selecting ingredients such as wheat, barley, brewing water, hops and yeast has led to a reputation that can only come from centuries of dedication to the craft, and with results you taste in every glass. Learn more about the brewery at www.pfungstaedter.de.